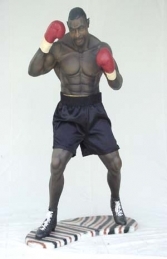 The Jolly Roger life-size models has a fantastic range of life-size and very life-like sports figures, from our towering basketball player to our 5ft jockey, most popular sports are covered. These large sporting figures look wonderful grouped together for a sporting or american theme display and are very popular for themed events & parties. There is also a range of 3ft sporting figures available for situations where there is not enough space for a full size figure.